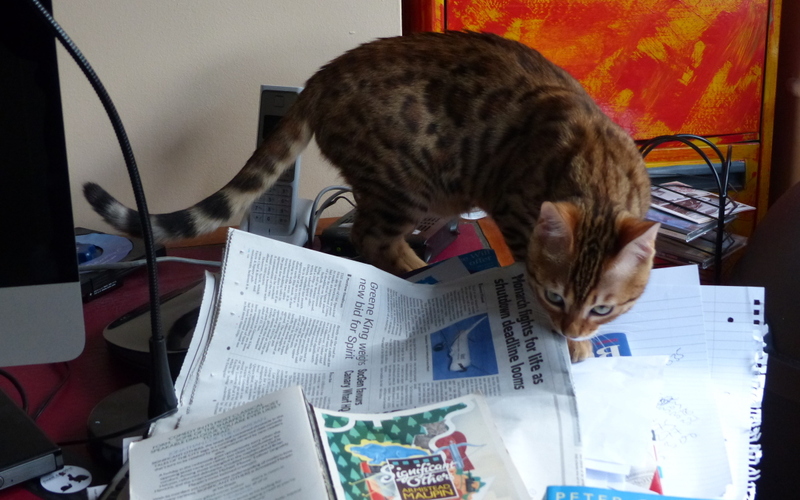 Bengal cats are a special breed, they are “WordCats”. They have been produced to train people all about one word in particular. I will break the whole pedigree of this particular word cat down for you so that if you ever think about getting a Bengal you will come back and read this first. Each cat selects a word that they wish to train humans about and that then determines their characteristics. In the same way that creatures that hunt at night grow extra large eyes or acute hearing, these Bengal wordcats are shaped by their chosen word. Often they choose “portmanteau words” with lots of different elements contained. The best way to describe this is to tell you about India, our newest wordcat. AS they say in all those reality judging shows I will give you the results in no particular order. First up is “Us” At this point I will hand you over to India to explain more clearly. Now the foolish amongst you might think that this “us” refers to the lovely bond between cat and carers. Wrong! At no point are a Bengal’s staff ever regarded as part of “us”. Even though they are excellent servants and can be made to pander to every whim, they are still not “us”! The more observant amongst you might then go on to think about “Them and Us” which is understandable, but once again, Wrong! Yes there is that natural distinction between “Us” the fabulous Bengals, and “them” the rest of the world, but you are not yet on the right track. All you have to do is remember what Bengals are. The clue is in the name that our larger cousins in India were given, “Royal Bengals”. That’s right, the “Us” is merely a standard practice for describing ourselves. Just like the Queen of England or Maggie Thatcher, when we refer to ourselves we use the royal “we”. So the “us” that started off this whole explanation is the most important part of everything, “Us”. Or if you prefer it in commoners’ terms “Me”! Oh and India is only my household name, If you wish I could give you my lineage and dynastic names, but you probably would not even begin to understand just how royal I am so we will leave that for now. “Tank” is the next part of my current chosen word. I am a little shocked at this, but it is the one my male staff used when he came down to find me the other night. Apparently he thought that we were being burgled and so came down looking slightly worried. It was only when he watched me push over the next rubbish bin and then leap around the study knocking books off the shelves that he called me a “tank”. My next word is “ ’ero” (as in hero) which I am quite naturally. It is in the blood you see. We are renowned for our great bravery and fearlessness and I have already attacked numerous mice and noisy balls with bells in; oh and I have almost destroyed that feathery thing on a long piece of elastic! Finally my last word is “Can”. And that is probably the best description of me. I am a Can Do Cat. I can do absolutely anything (that I want). I will admit though that sometimes my enthusiasm for being a “Can Do” Cat turns into a “will do” despite what you want! That is when blood tends to flow, not mine obviously, but these humans really do respond to a little sharp reminder of who is boss! So, there you have it. MY first word. Naturally over my lifetime I will try and show my humans lots of new words but for now all you have to do is put the bits together and you get…. Can tank ero us – Voila!